Philipp Bargfrede, at the club since 2004 - a true Green-White legend (Photo: W.DE). When Philipp Bargfrede looks out onto the pitch at the Weserstadion, the Weser river in Bremen or indeed the training pitches, he lets out a small smile, as memories of his long and illustrious career come flooding back. On Thursday, the 29-year-old ensured that he will keep making those kinds of memories at Werder Bremen by extending his contract with the club. He has already been at the club for 14 years and is here to stay for the next few. 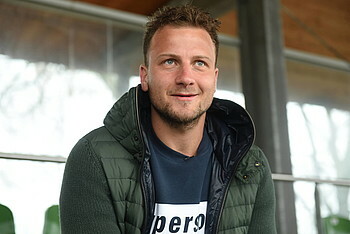 WERDER.DE caught up with Bargfrede to speak to him about his extension. When you think of Bremen, you think of the football club, its great tradition and in recent times also of Philipp Bargfrede. “Bremen is my home,” said the man himself. The talented young midfielder signed for the Green-Whites way back in 2004 but his ties to the club had already begun a few years before. “When I was twelve or thirteen I trained a few times and the club and played a few tournaments with them. That was my first step." His name and the club’s have been synonymous for some years now (Photo: W.DE). His father, Hans-Jürgen Bargfrede also played at Werder and both of their names are on the walls inside the Weserstadion. Despite his long career at the club. Bargi has never lived in Bremen. The midfielder was born in a to the northeast of Bremen called Zeven and has stayed there throughout his career. “I was really pleased that I could stay at home, with my friends and my family.” Bargfrede played 49 times in total for the youth teams starting at U17 level, before he made his step up to the first team. Now he is one of the most experienced players in a Green-White jersey, having already made 169 Bundesliga appearances and will be playing in his tenth Bundesliga season next year. A lot has changed in his time at the club both on a personal level and a professional level. In June 2017 he became a father for the second time, “I’ve become a bit more relaxed,” explained Bargi. Looking out on the youth training pitches where it all began (Photo: W.DE). Bargi has recently returned to the field after recovering from injury; however he is not a novice when it comes to being sidelined. “I was happy that we took our time after my last knee injury. I feel great at the minute and I’m really thankful for all the work of the backroom staff.” The Werder veteran is following an individual programmme but says, “the programme works.”The management and coaching team know what they have in Bargfrede and it is no coincidence that his return to the squad and Werder's great run of late have coincided. Long may it continue. “M retirement may have to wait yet,” said Bargfrede with a wry smile. “I’m looking to the future now though and have one eye on what I’m going to do after football. It’s too early to say what that might be,” said Bargfrede. One thing is for sure though: for the next few years Bargi will be calling Werder his home.